*We are no longer using our OLD BLOG here. 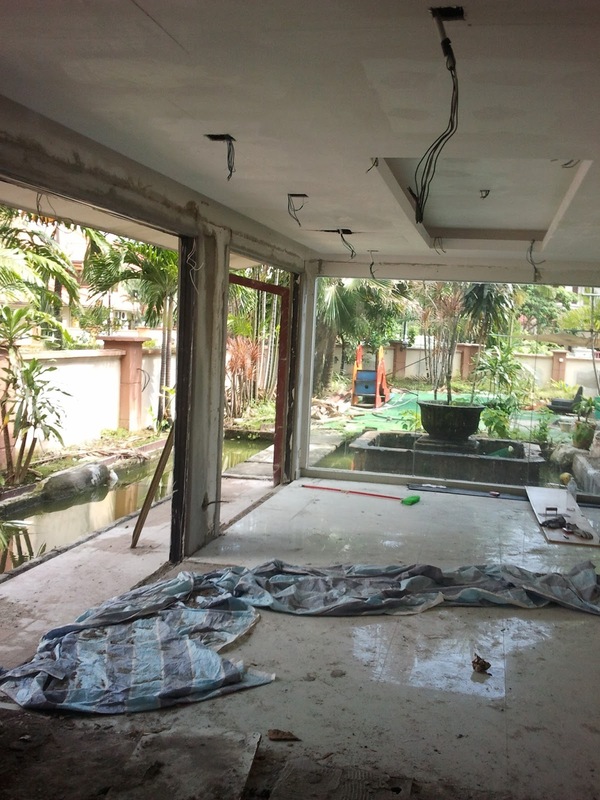 This project is an interesting one, a joint collaboration with contractor Pintas Kilas. The lady owner's favourite colour is deep pink, hence you can see a lot of this colour here. We also use a lot of warm tropical wood - dark nyatoh. 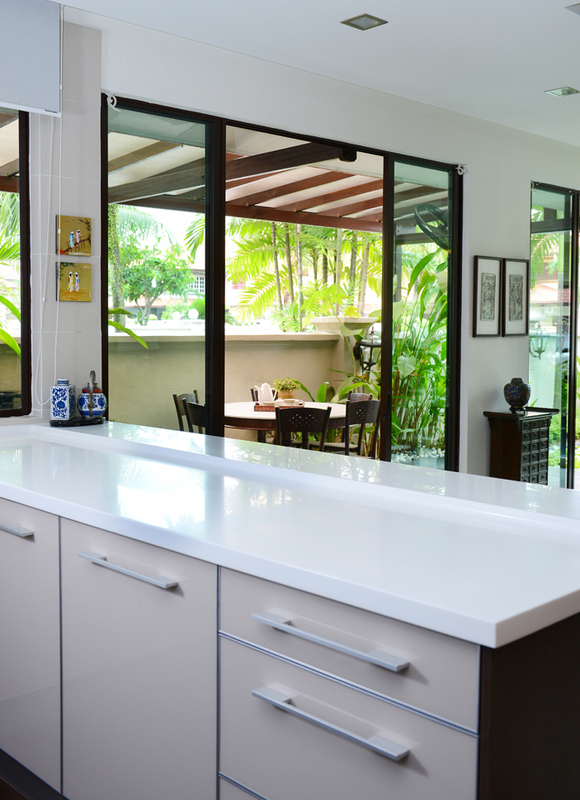 The material used in this kitchen is Modena Pigment Matt in Snow White colour. This space was originally the air-well. The owners created a concrete slab flooring on the 1st floor so that on the ground floor, this space is converted into a room. 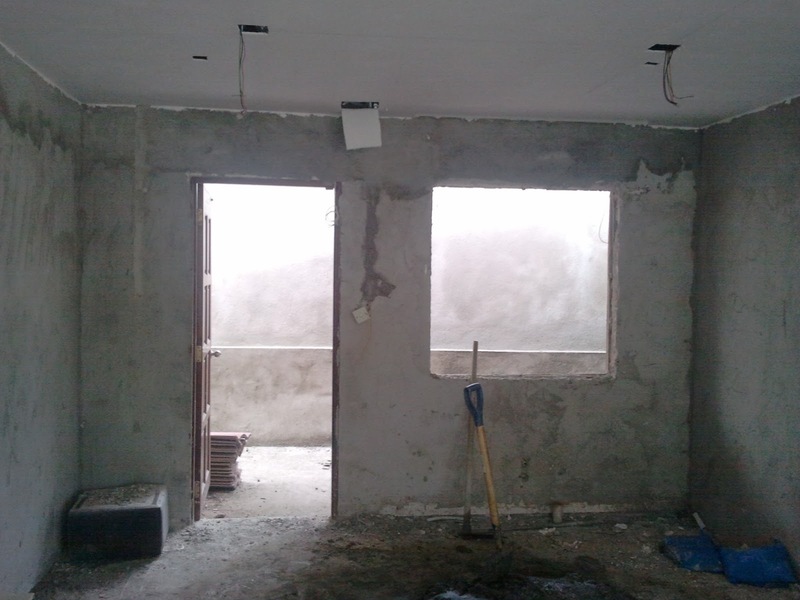 Behind this dry kitchen is the powder room, and adjoins to the living hall. 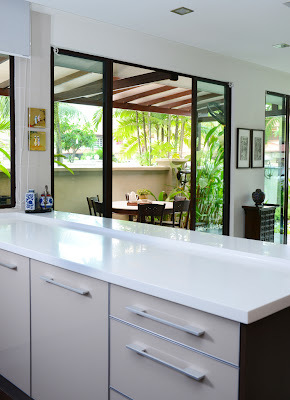 This dining room faces the dry kitchen. The walk-way to 1st floor is all cladded with nyatoh wood panelling. The four poster bed looks luxurious with light silky drapes. The walk-in wardrobe hidden behind the tv panel. 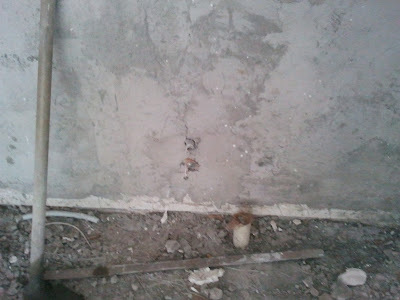 This is how the air-well looks like after it's sealed with a glass roofing and a new concrete slab done on the floor. 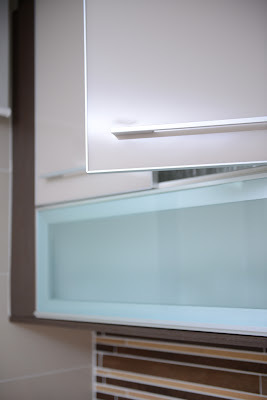 The rattan lighting creates interesting shadow effects on the walls in the bathroom. 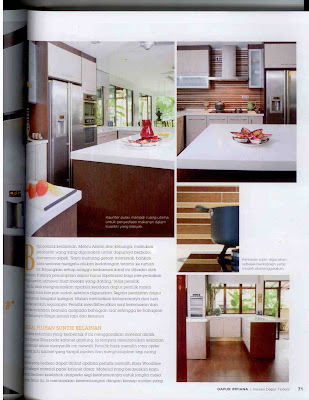 I am very excited to share that this Semi-D kitchen has been selected as a feature for 2 magazines! 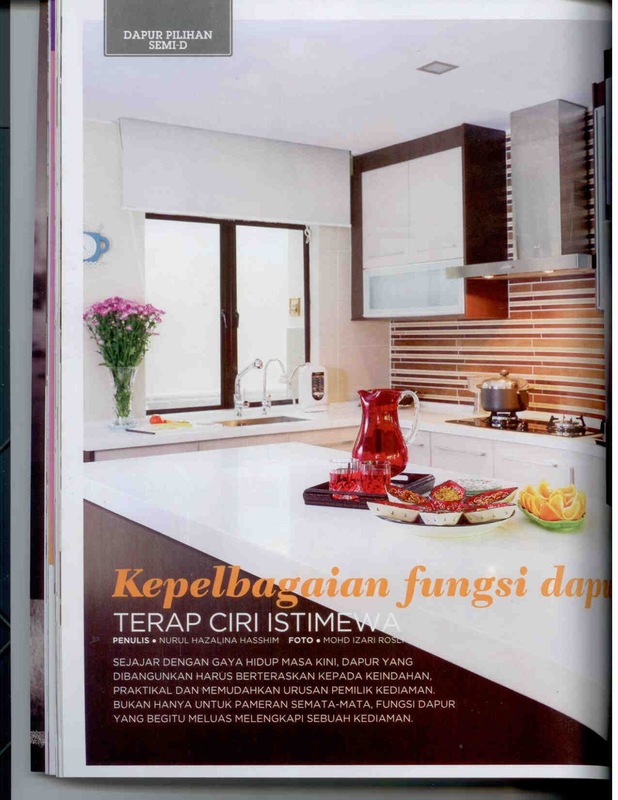 The first time this kitchen appeared in magazine was in the January/February 2013 issue of DAPUR IMPIAN. * The 2nd photoshoot and interview by Creative Homes has been scheduled on Friday 8th March 2013. I will post the pics later. 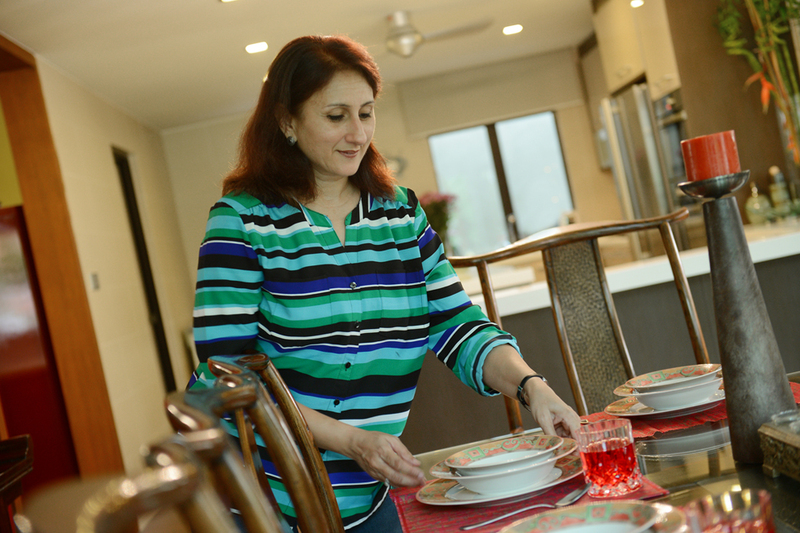 Mrs Aslam - the proud owner of this beautiful home who just loves to cook up a storm and entertain guests. 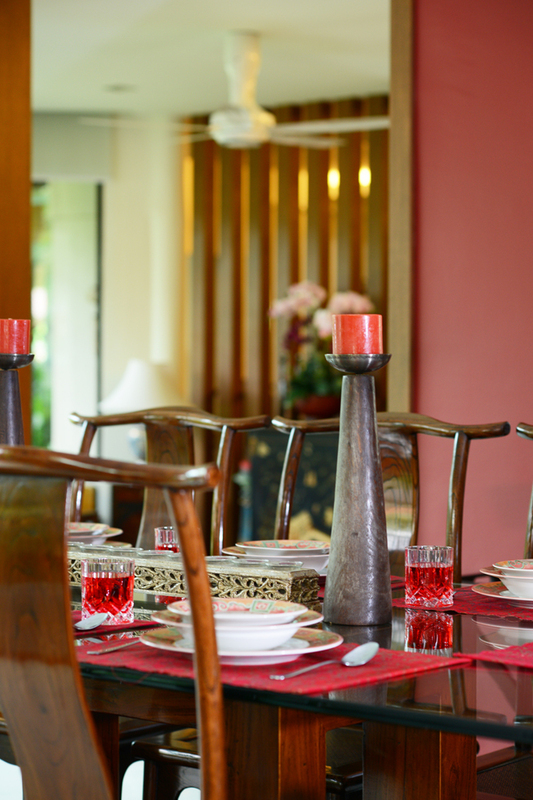 Mrs Aslam's comfortable and elegant dining area, where every piece of utensil is carefully selected to reflect the Contemporary Asian Style. Setting the time for this photoshoot wasn't very easy! 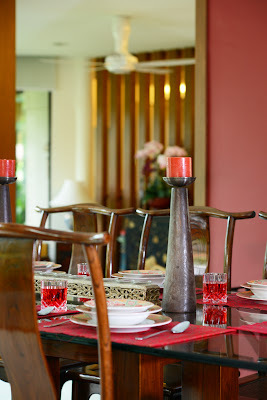 The Aslam family was extremely busy...There was almost always guests in the home and some sort of function going on! Mrs Aslam just love to be surrounded by visiting family members. 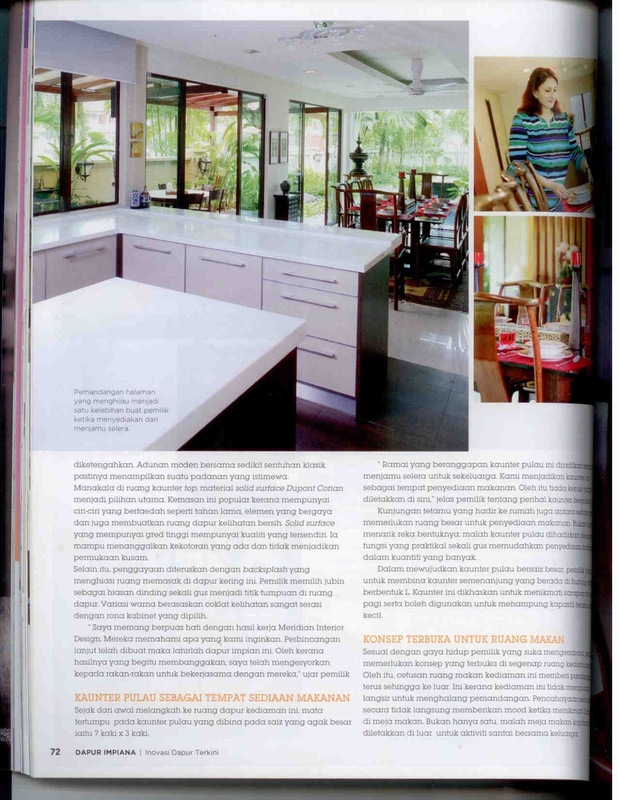 In fact, the DAPUR IMPIAN editor was so captivated by this kitchen that she wanted to come back for a 2nd photoshoot to get a better angle picture to put on the MAGAZINE COVER but we couldn't fix a date within the short notice as there were visiting relatives (from Singapore, I think) and the kind hostess didn't want her guests to be uncomfortable. 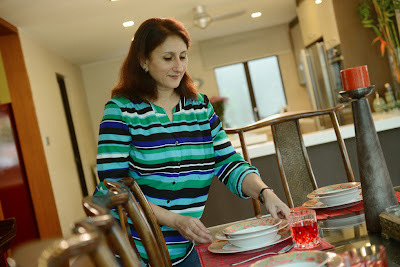 And because she loves people, Mrs Aslam makes sure her home is fully equipped with all the comfort stuff that makes the environment both warm, appealing and of course very inviting and welcoming for anyone who steps in. The modern kitchen that is functional, aesthetically pleasing and yet durable enough to cater to a busy cook. The owner asked for tiles instead of glass. She didn't want too much gloss. The handles are carefully selected so that there are no sharp edges, nor are there any protrusion that can "catch" our clothes. The 2 editors of DAPUR IMPIAN was rather curious and wondered why this long island unit has no chair or leg-in space for people to sit, unlike other kitchens they had visited. 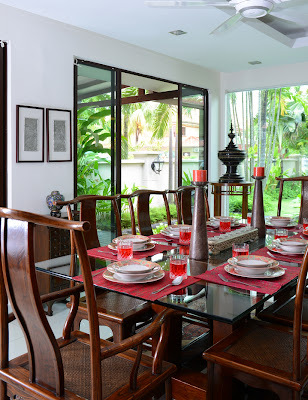 The owner explained that she had enough sitting space : a large dining table for proper sit-down dinners, and a kopitiam marble table in the garden for coffee or light meals. 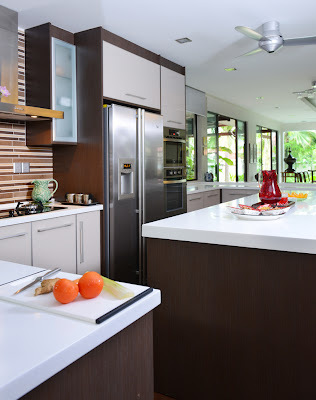 What she needed was lots of WORK SPACE - space for her to prepare food, must be big enough for the maid or any other relative/friend who is assisting her because her kitchen is an extremely busy one. She has chosen the top brand of solid surface - Dupont Corian which is an American brand and is stain-resistant ( however Dupont Corian is not scratch-proof ). A few weeks before the Dapur Impian team came, I had dropped by for my own photoshoot for pictures to be submitted to the magazine...Mrs Aslam showed me some yellowish stains on the solid surface that she couldn't get rid of. Her maid had wanted to use an abrasive detergent Cif to remove the stain. I said "NO!" ..anything abrasive would spoil the surface, because it's not scratch-proof. a) Use your finger to rub a clear detergent (not abrasive) like Sunglo or Sunlight into the stain. b) Leave for 15 minutes. c) Clean with a soft cloth and water. d) If the stain is not much, this would suffice. However, if there are any more remaining stains, repeat step (a) to (c) again. 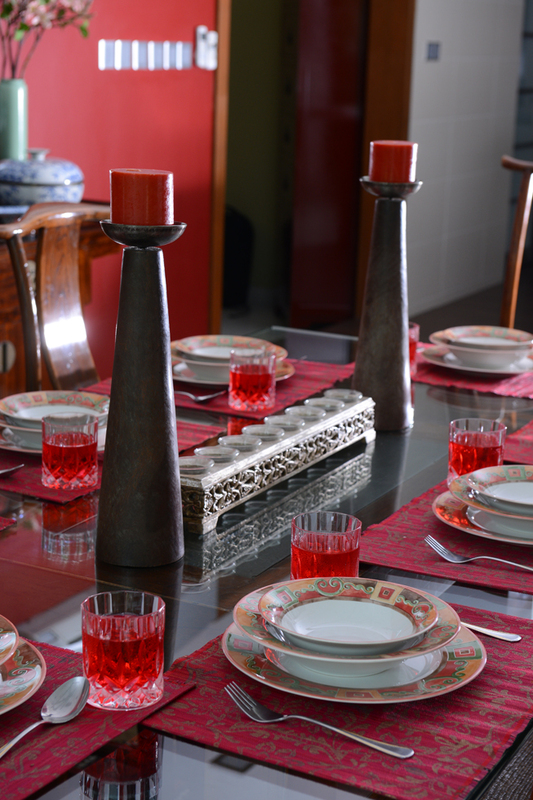 e) After removing stain, apply wax - PLEDGE Furniture Polish, which can be available in Ace hardware or Harvey Norman. I've also seen this in ColdStorage. f) The purpose of step (e) is to leave a layer of oil for the shiny glow. 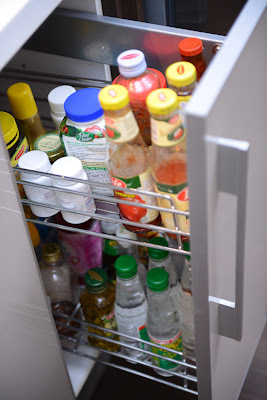 Also, the layer of oil prevents stubborn stains like curry and coffee from seeping in. The open kitchen is connected to the dining area, which overlooks the garden. Very pleasant dining environment indeed. 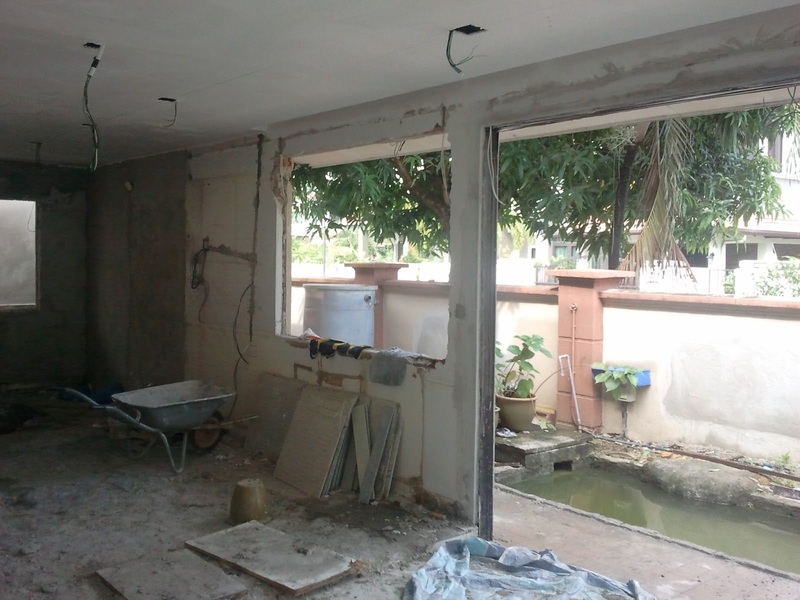 The owners didn't want any grilles on the glass panels - spoil the view, they say! 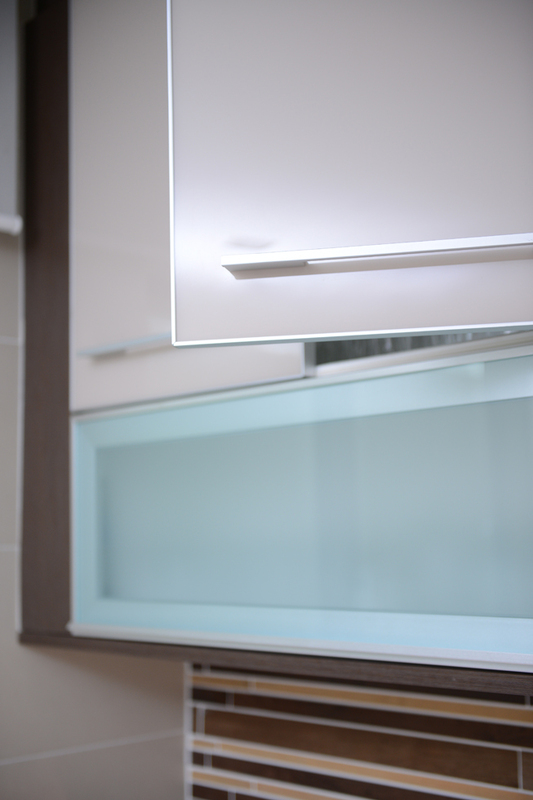 Our in-house brand of accessories, Etica, provide the modern luxury and convenience, minus the high expense of European brands. Same function, lesser costs. 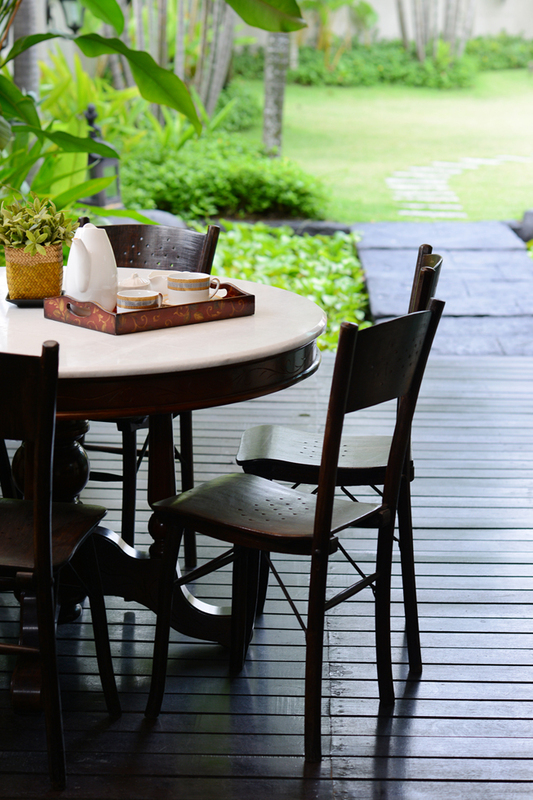 The kopitiam marble table located in the outdoors for light meals and coffee chats. 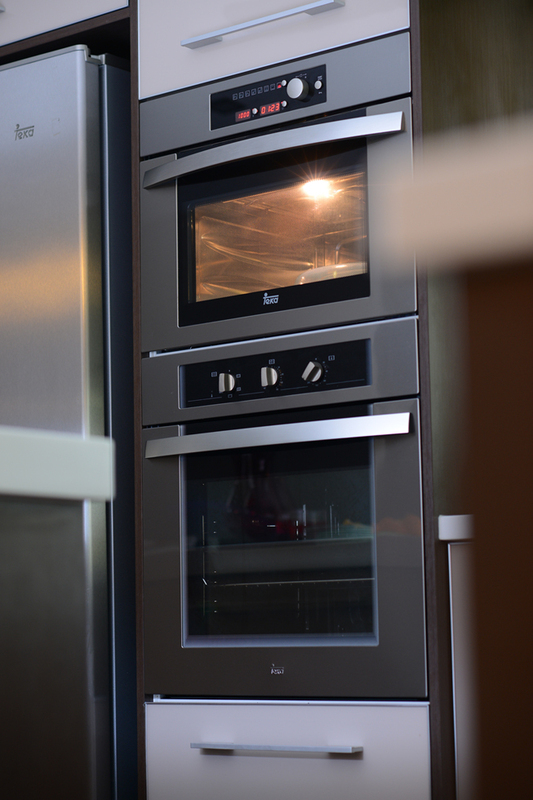 The owner insists on premium appliances - a Teka fridge, oven and microwave. A view of the kitchen, coming in from the living hall. The Aslam house is an interesting blend of Chinese furniture and pottery and some Persian and Turkish collection items. The tea room next to the dining area. Notice the blend of Chinese mother-of-pearl chests, Balinese teakwood day-bed, and Persian rug. Chinese blue pottery greets the visitor at the main door. The garden that surrounds the tea room and dining room. 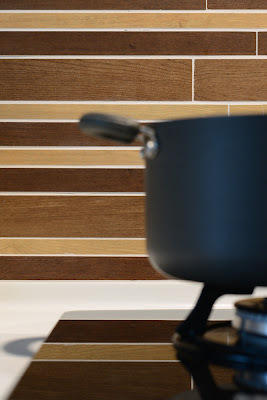 “ Right from the beginning, the designers at Meridian guided us through colours, concept and space planning , to come out with a very practical and attractive kitchen which is admired by all our friends. They also helped us with budgeting and worked out a reasonable price that fits our budget. As designers, we derive our satisfaction from watching the project develop from an empty canvass on the computer screen up to the stage where everything is fully delivered and installed. Our passion is to see everything turns out well. Normally I would advice our customers not to start hacking anything before the space planning and design concept is already confirmed and approved. 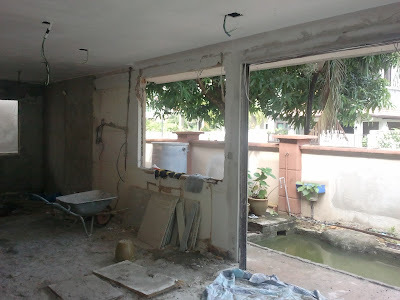 Unfortunately some people contact us AFTER their contractor has finished their civil works, in which case we won't be able to help improve on the layout and design. 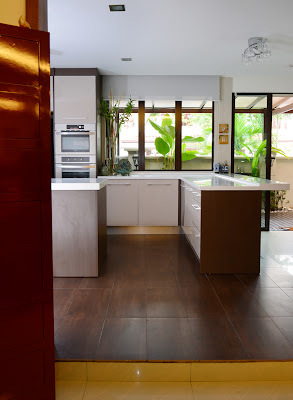 Since Meridian has 2 divisions, our sister company Meridian Inspiration Sdn Bhd, is specialized in modern kitchen cabinetry. 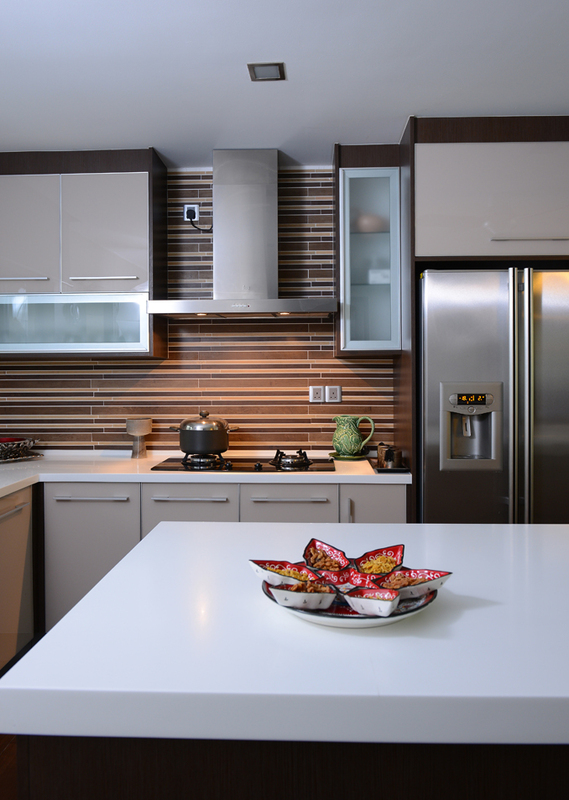 Space planning, electrical and plumbing planning in the kitchen is our specialty! 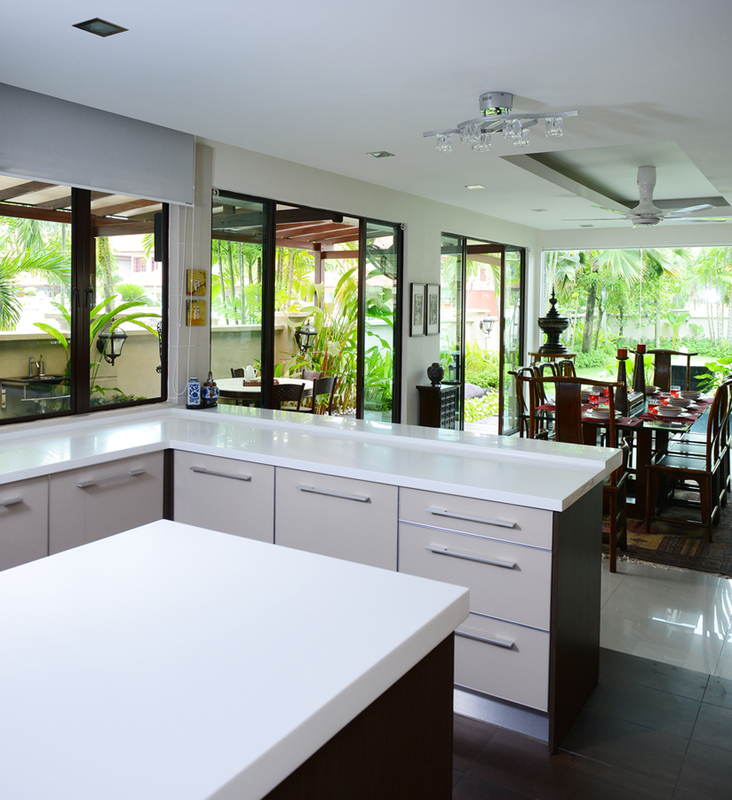 Therefore if you have left the planning to the contractor, then come to meet us after the contractor's job is done, you won't be able to fully benefit from a kitchen specialist's service. 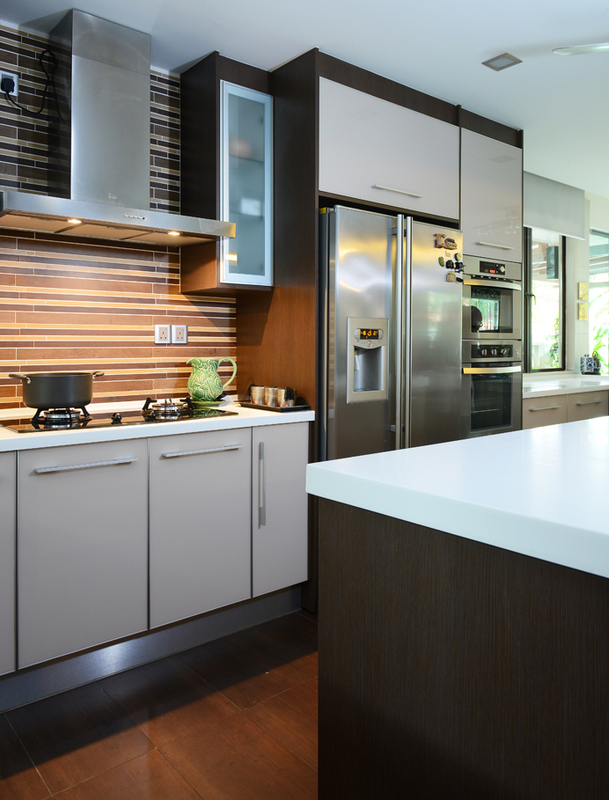 Meridian Inspiration carries the premium brand of kitchen - Signature, so all our Sales Designers are sent to the Signature factory once every 2 weeks for training. I place a lot of importance on upgrading of skills and knowledge so attendance at trainings are included as part of our KPI (Key Performance Index) measure. 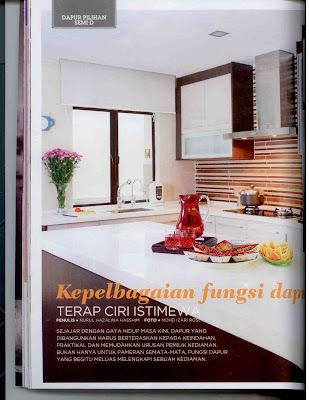 RENO & DECOR NOV '09 ISSUE. 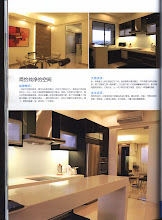 Designed for a bachelor pad, this project has been selected by Reno & Decor magazine to be featured in its Nov'09 issue for the modern minimalist concept that requires least maintenance. To see more pictures, click here. DESIGNER CONCEPT OCT '09 ISSUE. 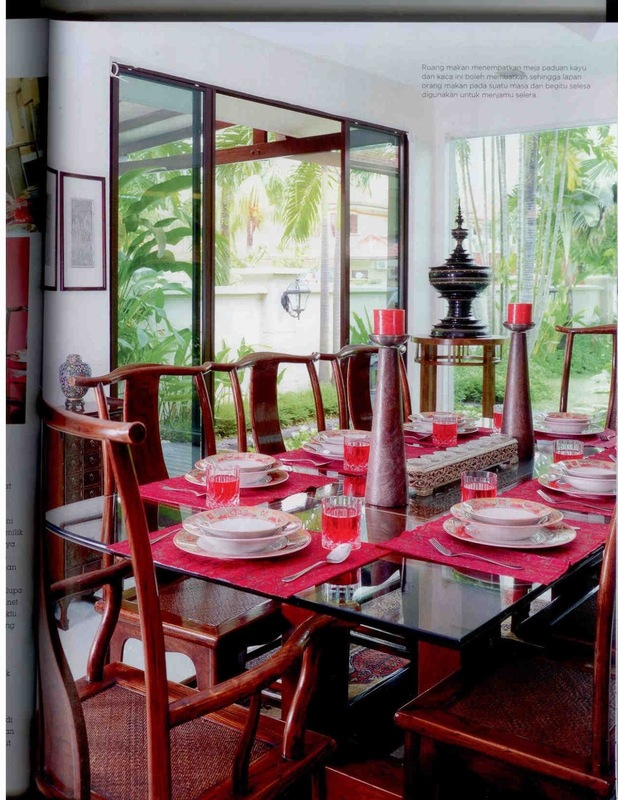 A very daring and flamboyant work, that's the main reason this project captured a publisher's attention and has been selected to be featured in Designer Concept Oct '09 issue. To see more pictures on this project, click here. 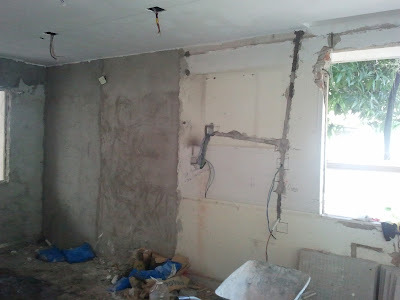 * Often times we are required to go out to project sites, so please make appointment before visiting. We do receive many emails and calls per day, please remind me just in case I accidentally missed out in replying to your enquiry. 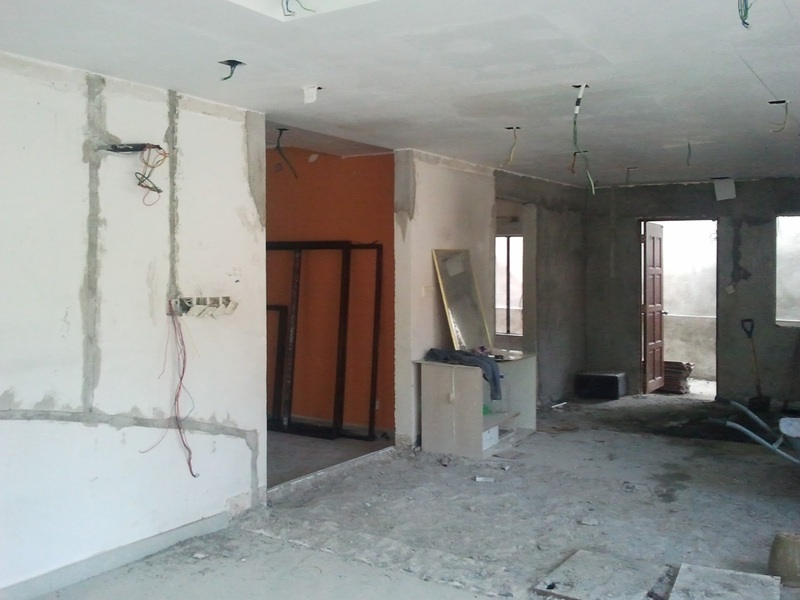 - interior design and renovation. 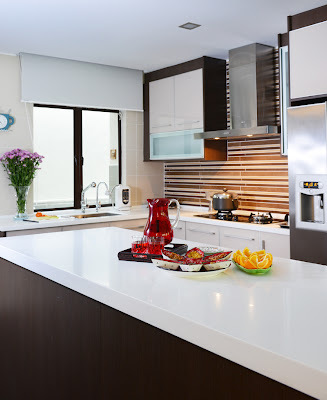 - kitchen cabinet and wardrobe using SignatureKitchen system. Our reader Wendy has so helpfully suggested that I put up a Work Schedule so that readers here will know which periods we are able to take in work. Welcome to connect with me on FACEBOOK! Should a houseowner be charged for these? Sign up as our Marketing Partner ! We will gladly share commission with you whenever you refer your friends, colleagues or family members to us. 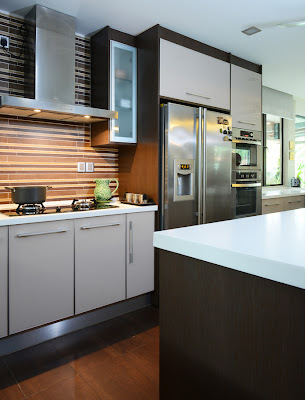 All you need to do is to open your eyes and ears for people who require kitchen cabinets and tell them about us, then give us a call so that we will follow up. 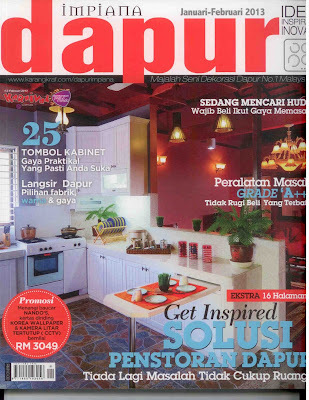 To register as our Marketing Partner, contact Lola at lola@meridiandesign.com.my or 016-2926357. 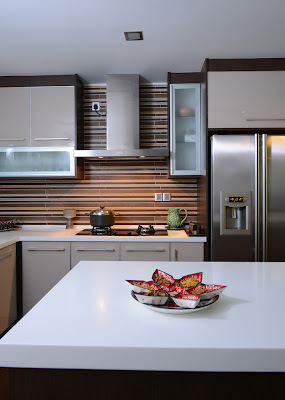 MERIDIAN INTERIOR DESIGN S/B - interior design and renovation. 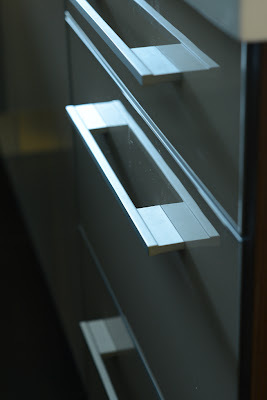 MERIDIAN INSPIRATION S/B - kitchen cabinet and wardrobe using SignatureKitchen system. 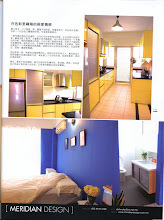 ADD : 14, Jalan SS 15/4, 47500 Subang Jaya, Selangor, Malaysia.